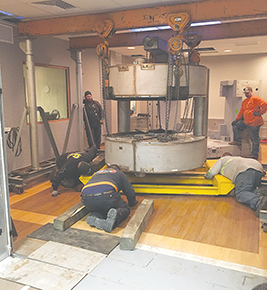 OUT WITH THE OLD — The rigging company worked to remove the old machine last month to make room for the new MRI unit. A removable wall was taken down during the process to allow the machine to be moved out of the room. Plywood was also placed on the hospital floors to prevent damages. The Hitachi Echelon Oval 1.5T Magnet. A new year calls for new changes. In a lot of cases, this means out with the old and in with the new. For the Boone County Health Center, this meant removing the 10-year-old, 45-ton MRI unit earlier in January. Boone County MRI techs Holly Carraher, Cindra Steinbach and Melissa Wiese travelled to multiple sites looking at different scanners before recommending the Hitachi Echelon Oval 1.5T Magnet to administration and the BCHC Board. “The Echelon’s oval gantry configuration offers the widest bore (opening) available on the market, providing patient comfort and ease of positioning,” Steinbach,” said. The old unit was a lower strength magnet, and according to Radiology Supervisor Brenda Warner, it was time for an upgrade. 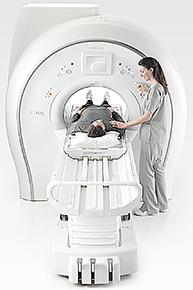 Carraher and Wiese said the Hitachi Echelon Oval will significantly increase the clarity and quality of MRI images. The machine will also offer patients more space for added comfort and less anxiety during exams. Shortened scan times and the ability to offer more exam types will be added benefits. Expected delivery for the new unit is set for Feb. 23. After installation, construction and testing are finished, the MRI technologists will begin training applications to learn the new machine and software. The Echelon Oval is expected to be ready for patients by the end of March. Currently, the department is working out of a mobile unit until the new unit is ready for use.